Mangaluru, May 01, 2016: Reports are rife that at least 50 members of MBC Mangalore Bicycle Club joined hands with two volunteers of GoGreenGoCycling initiative in their mission “CycleforCause” on Apr 30, Saturday. They first went around the city for about 15 km collected more members along with GoGreen activists K.G. 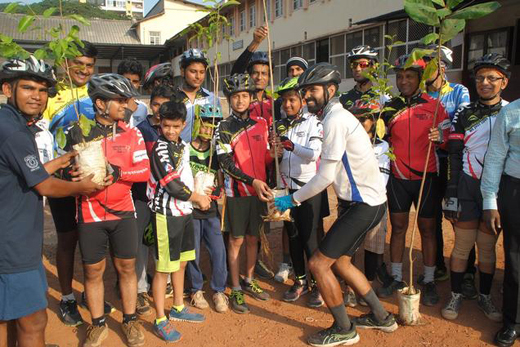 Sunil and Saibanna Pujari, the cyclists then assembled at the Canara High School in Urva and planted saplings along with officials from the Forest Department. Sunil and Pujari started their bicycle ride on April 22 (World Earth Day) from Bengaluru and are on a mission of visiting every district headquarters in the State. Having visited Mandya, Mysuru and Kodagu districts, the duo were in Dakshina Kannada to promote the cause of environment. The Mangaluru ride started at 6 a.m. with Sunil exhorting MBC members. Describing the ride, Sunil said it was aimed at promoting non-motorised transport as well as creating awareness on environment. Sunil said their mission would culminate on June 5 at Kanteerava Stadium in Bengaluru where the Karnataka State Pollution Control Board has organised a mega-event to mark the World Environment Day. Not less than 3,000 cyclists would assemble at the venue to make their presence felt. Whenever cyclists demand separate track, the authorities would brush it aside saying there were not many cyclists. Now, this is the right opportunity to exhibit cyclists’ strength, Sunil said. Deputy Conservator of Forests K.T. Hanumanthappa and Range Forest Officer Sridhar planted a few saplings on the school premises along with the cyclists.